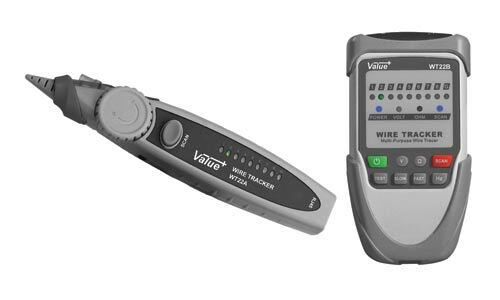 Combines the functionality of a cable tracer and network cable tester in one convenient unit. The main unit can be connected to an unidentified pair which injects an audible signal down the line. 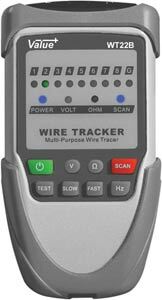 The “tracer” unit may then be used at the other end of the cable run to identify the correct conductors. In addition, patch leads & field wiring may be plugged inline between the units to provide instant verification of continuity and correct wiring sequence. Probe includes an LED light for easy cable identification when in dark areas. Suits RJ45 and RJ11 leads. Requires 3 x AA and 1 x 9V batteries.